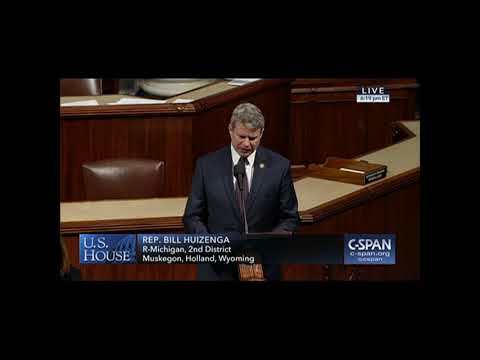 U.S. Rep. Bill Huizenga (HIGH-zen-guh) represents the 2nd District of Michigan, which stretches from Kentwood to the lakeshore and up the coast of Lake Michigan from Holland to Ludington. Huizenga was first elected to Congress in 2010 and is currently serving in his second term. Congressman Huizenga is a proven leader in efforts to protect life, limit government, and enact common sense regulatory and tax reform. During his time in Congress, he has focused on removing government barriers to private-sector job creation and economic growth, cutting government spending, ensuring transparency, and rebuilding the bonds of trust between the American people and their representatives in Washington. Huizenga will be returning to serve a second term on the prestigious House Financial Services Committee. 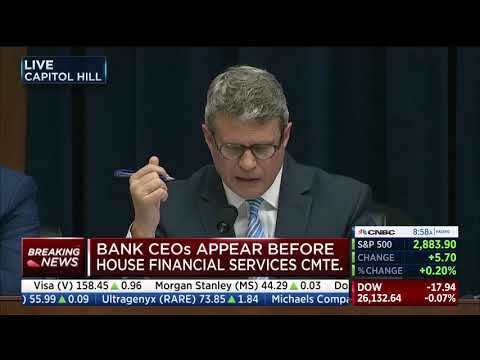 The Committee has jurisdiction over all issues pertaining to: the banking system, housing, insurance, and securities and exchanges. Additionally the committee also oversees monetary policy, international finance, international monetary organizations, and efforts to combat terrorist financing. 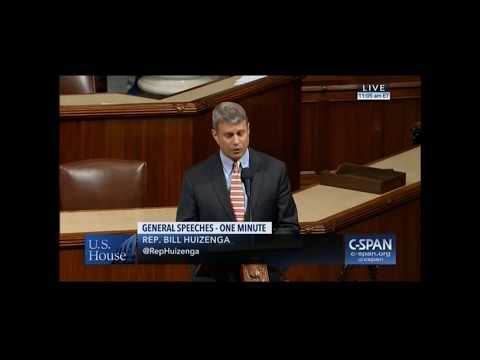 This Congress, Congressman Huizenga has been selected to be Vice-Chairman of the Monetary Policy and Trade Subcommittee. 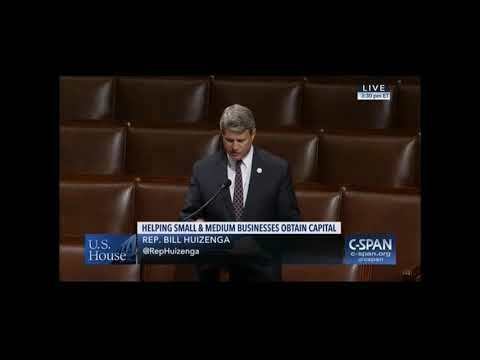 As Vice Chair, Congressman Huizenga will assist Subcommittee Chairman John Campbell (CA-45) in running committee hearings and essential committee operations. The subcommittee has jurisdiction over legislation pertaining to: economic growth and stabilization; domestic monetary policy, including the effect of such policy and other financial actions on interest rates, the allocation of credit, and the structure and functioning of domestic financial institutions; coins, coinage, currency, and medals, including commemorative coins and medals, proof and mint sets and other special coins, and counterfeiting; international trade; the International Monetary Fund (IMF); and international investment policies, both as they relate to United States investments for trade purposes by citizens of the United States and investments made by all foreign entities in the United States. Huizenga got his start in both business and politics as a child sitting at the dinner table, where his family was encouraged to discuss both – even if they didn’t always agree. Huizenga attended Holland Christian High School, and received his bachelor’s degree in Political Science from Calvin College. He made his first real estate investment during college, and worked in the private sector as a Realtor and entrepreneur. He became deeply familiar with issues and communities across West Michigan when he began working for Congressman Pete Hoekstra as Director of Public Policy in 1997. As co-owner of Huizenga Gravel, Inc., in Jenison, MI, he intimately understands the regulatory and tax issues small business owners face, having first-hand experience as its owner since 1999. In 2002, Huizenga felt the call for public service, running and being elected to serve the southern portion of Ottawa County, Michigan’s 90th District, in the Michigan House of Representatives. There, he served in elected leadership roles as well as Chairman of the Commerce Committee. He was re-elected until term-limited out in 2008. Huizenga was born and raised in Zeeland, Michigan, where he currently resides with his wife, Natalie, and their five children. His children were the reason he ran for public office. They inspired him to strive for an environment of prosperity for their generation, too; one that encourages job creation through private sector growth, cuts spending, reduces the size of government and keeps Americans safe at home and abroad.